GoCharge's wireless charging furniture can be customized with Corian, Quartz or Formica surfaces. 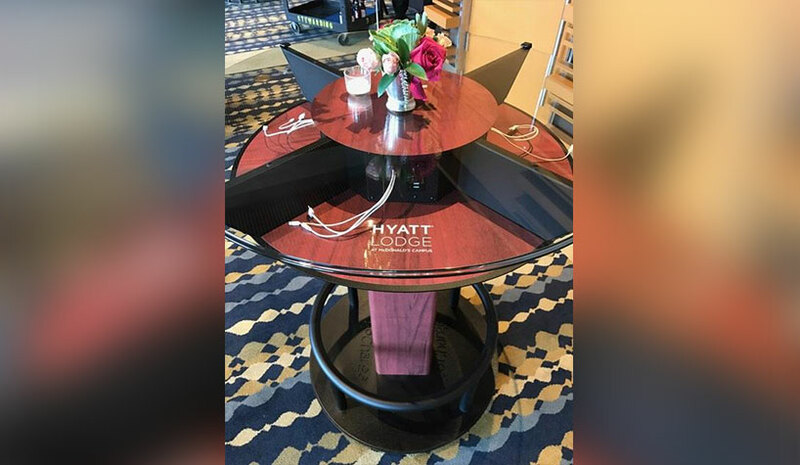 NEW YORK—For guests obsessed with their devices, goCharge is introducing tables that double as wireless charging stations for smartphones. Established in 2009, goCharge’s mission is to provide “the power to stay connected” through a range of charging solutions and technology. The company’s charging stations are found at conferences, trade shows, concerts, sporting events and music festivals, as well as hospitals, universities, casinos, shopping malls and more. Powering up devices is free at goCharge’s charging stations. The company’s charging stations have a variety of cords to accommodate various types of devices, including wireless charging spots for the newer phones. According to Walke, some models charge smartphones at the same rate as a home charger and some have rapid charging capabilities built in. In 2017, goCharge introduced Canvass, a proprietary mobile engagement platform that can provide usage metrics, consumer intelligence, lead generation and ongoing customer engagement through surveys, sweepstakes, ads, app downloads and customized offers. This year, the team rolled out wireless charging capabilities embedded into Dupont Corian surfaces. “Although all of our charging stations are very attractive and professionally ‘wrapped’ with colorful, eye-catching artwork, our newest line of wireless charging furniture is stunning and can be customized with Corian, Quartz or Formica surfaces in a variety of colors, sizes and shapes,” he said. The onboarding process for goCharge is straightforward. There are manuals with each charging station, white glove service for setup, and 24/7 customer service available. With the advent of Airbnb, VRBO and staycations, hotels have to work harder to attract guests and visitors.